One of the quickest ways of making sure your children get plenty of exercise and stay fit is to walk them to school every day. If it is genuinely too far to walk then cycling to school may be a possibility. But, apart from factoring in enough time, your one over-riding concern about one of these options is making sure that your children are walking or cycling to school safely. 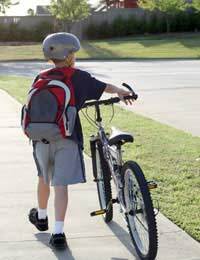 It is likely that you do not want your child to walk or cycle to school alone until they are of a certain age. In this case you will want to make sure you can walk or cycle with them. If you work then this could present you with a problem as you may then need to go home to pick up the car to get to work on time. But in this case, you just have to make sure you can work around the problem. If you work flexi-time or have understanding bosses, then you can look into the possibility of starting work at 9.30am instead of 9am, giving you more time. Of course, then you may leave yourself with a similar problem in the evenings, but perhaps your child has a friend whose parents you can team up with, with one doing the morning drop off and one doing the evening. Or you and your partner can take it in turns to do the drop off and pick up. And with regards to needing the car to get to work, it could be worth bearing in mind that you may be able to walk to work yourself, after you have dropped the children off. This will improve your fitness and help to cut your carbon footprint into the bargain. Another way of ensuring that your child is walking to school safely is to use walking buses if their school has such a system. The walking buses are schemes set up by the school and local authority to encourage parents to leave the car at home and let their children walk to school. But the entire emphasis is on safety. The children meet the walking bus volunteers at a pre-determined point, are given fluorescent jackets with walking bus emblazoned on them and then are walked to school, in crocodile formation, safely, by people who have volunteered their time to do it. If you prefer your child to cycle to school then it is wise to make sure they have done at least their bronze cycle award and preferably their silver and gold too. These awards are a type of cycling proficiency exam and teach your child about the dangers they face and equip them with the necessary skills which they will need to cycle to school safely. In addition, if you are contemplating letting them cycle to school, some aspects of safety are absolutely non-negotiable. They must wear a cycle helmet – this could literally save their life. But they must also wear high visibility jackets which shine during the day and the night to ensure they are visible to motorists and their safety at all times. Walking and cycling to school are a great way of improving your child’s fitness and making sure that they do not put on weight. In addition, the exercise will help them focus their minds and therefore perform better in school, in addition to tiring them out ready for a sensible bedtime. But safety is the most important aspect of cycling or walking to school and you must make sure that your children are aware of the safety measures they must take, rather than you just doing it all for them.